Mercedes E63 AMG wagon headed to U.S.
A wagon version of the 2012 Mercedes-Benz E63 AMG will arrive in U.S. showrooms this fall. The 2011 E63 AMG sedan is shown. 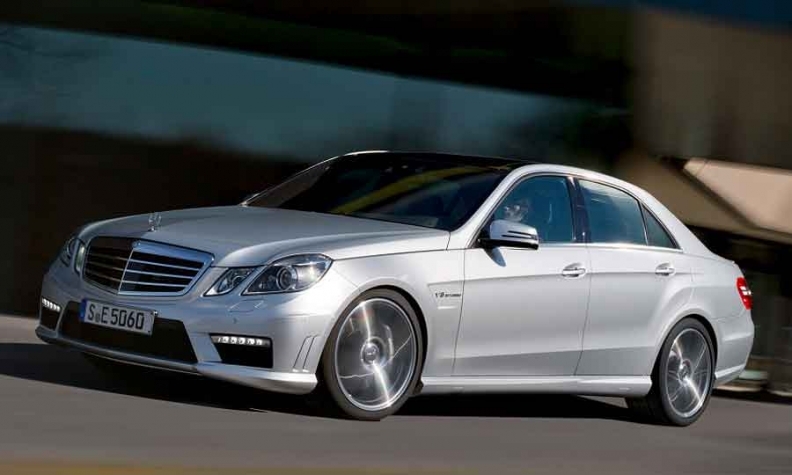 Mercedes-Benz officials confirmed Thursday that the 2012 E63 AMG wagon will be part of the North American lineup. Slated to arrive in October, the high-performance wagon will receive the same 5.5-liter twin-turbocharged, direct-injection V-8 that debuted in the 2012 E63 AMG sedan at the New York auto show in March. The engine produces 518 hp and 516 pounds feet of torque. An optional performance package boosts the output to 550 hp and 590 pounds feet of torque. Like its sedan counterpart, the 2012 E63 AMG wagon receives stop/start technology paired with a seven-speed multiclutch transmission. The wagon version receives the panoramic roof as standard equipment. The Mercedes-Benz E63 AMG wagon was sold in the United States with the previous E-class generation through the 2009 model year. Mercedes spokesman Dan Barlie says it had a loyal customer base, and the E350 4matic nonperformance wagon still attracts some of the wealthiest Mercedes buyers.